With everything that’s going on in the world at the moment, it’s no surprise that a slew of designers sent various shades of yellow down the runway for SS18. An instant mood-lifter that we can all appreciate during the cold winter months, yellow will add a welcome burst of color into our drab cold-weather wardrobes – it's the perfect antidote to a season of gray, black and navy. 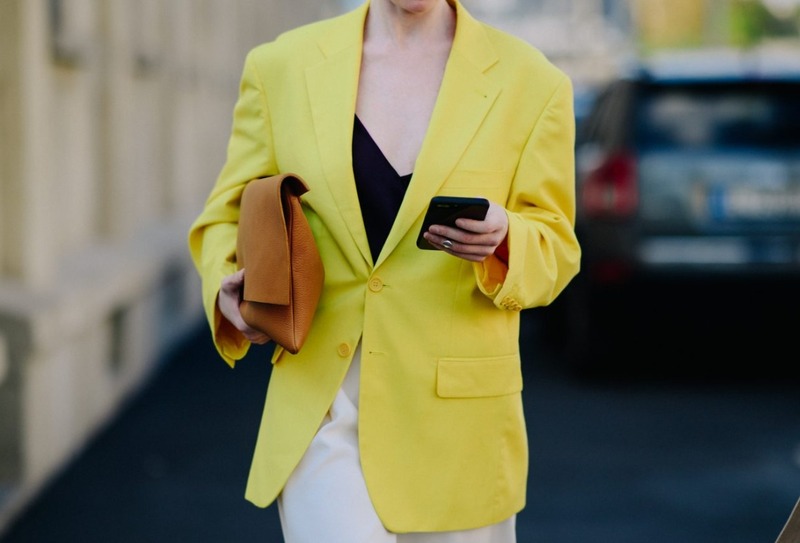 If the thought of wearing yellow sounds a bit scary, don’t worry – every shade from citrus to egg-yolk has been covered, so there’s sure to be one that works for you. Keep scrolling to discover the yellow hues you need to know for spring. Whether worn from head to toe or mixed with other pastels, sorbet yellow was spotted all over the runways for SS18. Millennial pink was paired with Gen-Z yellow at Céline, where tailored suits and pleated skirts were delivered in a pastel palette, while Loewe’s patchwork dresses showcased the shade without going overboard. If the spring shows are anything to go by, sorbet yellow is best served with equally-as-sweet hues. From the trench coats at Derek Lam to the 70s-inspired dresses at Tibi, egg-yolk colors dominated the catwalks for the new season. While we can’t think of a better way to see in spring, we know wearing this bright shade can be tricky – thankfully, a handful of street-style stars proved how easy it can be to incorporate the color into your look; try knotting a sunshine-hued scarf around your neck, or layer a yellow shirt under a dress for a subtle splash of color. Mansur Gavriel and Self-Portrait both opted for lemon tones this season, but they couldn’t have been more different: the latter’s came in the form of floaty floral-print dresses, while the former delivered sharp tailored suits with a citrus punch. When it comes to this shade, anything goes. Try teaming an oversized blazer with monochrome pieces for an understated take on the trend. Just as Pantone predicted, highlighter yellow made more than one appearance on the runway for spring 2018. Everyone from Emilia Wickstead to Christopher Kane presented neon-yellow dresses for the new season, proving this daring trend is here to stay. This color is designed to make a statement, so don't hold back: wear it from head to toe with a maxi dress and team with sneakers for an effortless finish. Possibly the easiest shade of yellow to pull off, mustard hues made a serious comeback for spring/summer 18. Need proof? The butter-soft leather suits, relaxed linen pants and asymmetric tops at Simon Miller should be all the evidence you need. Easy to wear with denim, mustard pieces are about to take over your closet.